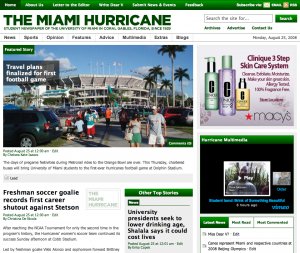 The redesigned TheMiamiHurricane.com is now live! No big surprises, if saw the beta site. Lots of big surprises if you missed the beta. 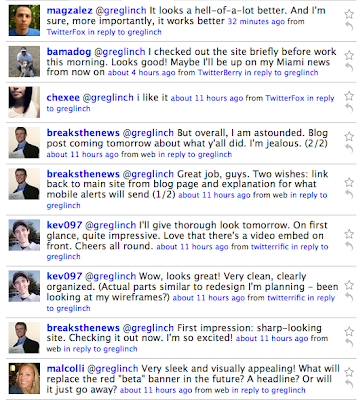 For an idea of what was going on right when we launched, check out my Twitter account late Sunday night, beginning a little before midnight: twitter.com/greglinch. Webmaster Brian Schlansky (Twitter) has written an in-depth account of the technical side of the entire redesign process, which will be posted on theÂ Innovation in College Media blog and republished here. I plan to introduce the post with an overview from my perspective of leading the project. Finally, I’ve drafted a long list of people to thank, which I will post here as well. Thanks again to everyone! Weigh in: What do you think of the new site? It’s been a little more than a week since we launched beta.themiamihurricane.com and we’ve received a lot of positive feedback. But we want more! Good or bad. Below are some comments from Twitter after we launched the beta site. In addition, we’ve received feedback via e-mail and the form we created. Many thanks to everyone who responded. Webmaster Brian Schlansky has already made a few changes based on comments, as well as made tweaks our Hurricane online team has discussed. Switching on-site video player from SlideShowPro to Vimeo, including the video widget. We can now track on-site views and have better looking videos (credit to Brian Schlansky). All videos will also be on YouTube. Switched cover view from SlideShowPro to Issuu (credit for the idea goes to Andrew Dunn, via this post). Created a uniform color for hovering over links (credit to Visuals Editor Shayna Blumenthal). What else should we add, remove or change? Be brutal. Please send any suggestions to feedback@themiamihurricane.com or use the online form. Also, feel free to comment below. Read my post about launching the beta site and Editor in Chief Matt Bunch’s welcome letter.